In the emerging 2014 scenario, it is no longer necessary to take the help of app developers who are expensive. Now it has become very easy to develop apps for business purposes for which many platforms are available online. With the advent of DIY – do-it-yourself, there is no need to have any technical knowledge for building the app. These platforms enable app creators connect with potential clients from their mobile handsets. Previously called Conduit Mobile helps a business to make apps, market them and manage the mobile apps. The Como Console is the redesigned version of the development platform. Through this members can create apps which have a professional look and feel through the use of a collection of varying thematic presentations with variations of colors, the icons, layout templates with a diversity of styles including backgrounds. Customers have the facility to make payments for their purchases through the MyCheck payment gateway. Customers can track their order delivery status via Bringg. In addition to being a DIY platform help and guidance is provided for the aspects of app distribution and app management. The company’s Marketing Genie tool guides on promotion of the app both online and offline. Ad campaigns launched through Facebook and also promotion through physical store points by using QR Codification, window stickers and certificates and also through printed materials. There is also a Management Dashboard through which user activities viz., customer order, reservations, delivery tracking, distribution of coupons and loyalty benefits can be monitored and also the performance checks can be carried out. The created apps are compliant with most mobile phone models and also Kindle devices. Through a recent partnership signed Amazon it has become possible to sell the apps through the Amazon App store. The Mobincube App Builder is a complete mobile generators platform, applications given the degree of customization permitted. It gives a complete range of support service detailed step by step for beginners in programming, and furnishes a very good gallery of pre-designed templates for different types of content. In terms of graphics and visual editing interface provides a greater degree of freedom in deciding the brand image of the application. Regarding integration of functionality in the application, it is quite intuitive and practical and offers the ability to export the project to major mobile platforms like the iOS or the Android, the HTML5, BlackBerry or the Windows Phone. The Mobincube App Builder has customized plans that vary depending on the features to be incorporated in the application. It also has interesting revenue generating models which allow the easy integration of ads in the application for generating some money. The BlackBerry App Building platform can be used to create app in a simple and intuitive way. Like the other support services, BlackBerry App Generator enables the user to create applications for various versions of the BlackBerry OS even without any previous knowledge of the intricacies of programming. An interesting tool for users, then focused on content creation platform as it uses an RSS feed from the web page for support and for automatic creation of the app. After the information is captured the need is only for customizing the interface to the user preferences, which can include the icons, the banners and any other element. The application has limited edition graphics and visual application which results in a more or less standard image and permits anyone without any programming knowledge to create their own application for the BlackBerry at no charge. This is an app creator and also a publisher, which enables the user to make native Android apps, and also HTML5 apps for iOS, Windows Phones and devices with BlackBerry. It has a dedicated team of application developers who makes sure that the best app possible for the business is created. To create an app a 3-step processing needs to be is to be followed. Firstly a selection from of the list of 37 app types is to be made like general business or online business, a restaurant, or a salon, and similar other categories. The second involves building the app and including features like menus, pages, multimedia, some forms, some relevant social networking links and some other content. The apps can be previewed during the development process and suitable edited whenever the need arises. Finally the app is submitted for publishing. The dedicated teams of developers conduct a review and make necessary enhanced features so that the app store quality parameters are fulfilled. Appsbar also helps the businesses ways and means of promoting apps developed by them. . Once the app has been published, it can be shared through social media networks like Twitter, Facebook, and Google+ and similar others. Appsbar also provides a free marketplace named appcatch which functions in the same way as an apple app store. This is a totally free application and users have the freedom for creating and publishing their DIY applications. 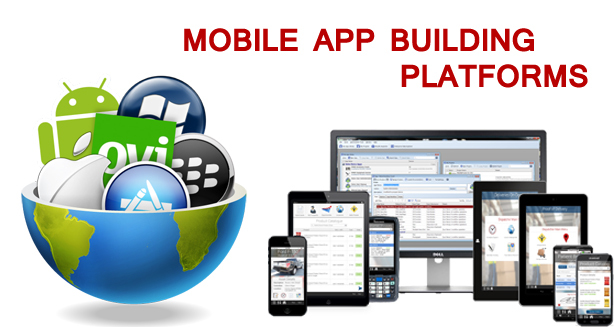 This is a very popular mobile app-builder platform and has tools which are being used globally. It has drag-and-drop facilities in its platform and this makes it easier to create mobile apps for almost every major platform like the Android, iOS, BlackBerry and Windows Phone. There is the facility to automatically publish the app in the respective app store, and also the platforms dedicated marketplace which is free to use. Appy Pie apps enable a business user a full set of unique features which enables them to stay connected with their customers. Users of this platform can use push notifications, share through the social media and by integrating their blogs. There are also photo galleries, and sharing capabilities. Many business tools are there like a scheduler for making appointments; tools like the GrubHub, OpenTable, and a Menu building tool; there also options for passbook coupons; tracking of deliveries through GPS a one touch call facility, a QR coding facility and the facility to integrate with a website. Appy Pie gives has many tools for the management of apps so that customer feedback on performance can be used to make real time changes to the app. This is also is a browser-based platform with an app builder through a drag-and-drop utility which helps the users to build customized, very superior-quality apps for android, iOS, and the HTML5. Because there is no reliance on the use of templates the platform helps the user to make customized and apps which are rich in feature in the native and HTML5. The features of location-based services and push notifications together with live streaming and a number of integrations to the social media network beyond Facebook, LinkedIn and Twitter. The platform also has the facility to store text, audio, video and texts which are used in the app as it is integrated with the Cloud CMS and also a Data Manager which works with different kinds of data sources which include RSS and also XML. There is a User Manager for where administrators can give permissions to various users so that they can manage the different features of the application. An Analytics tool enables the platforms own analytics to become integrated the analytics of Omniture, or Google. EachScape offers a free trial to get started. This is a cost-efficient way to create a professional, looking and full-featured app either all alone or using some help from designers. With AppMachine, businesses can build free apps and only pay after the publishing of the app. Using this platform the business gets a choice for implementing either standard or apps with advanced features. Standard features have things like activities, videos, photos music, social network linkages, contact info, analytic tools and more. Advanced features have an online store with customized coding and with Web services to facilitate the connections with data sources of an external nature. The services start at $499 per published app. As the app is built, additional features which are added are leveraged into the cost of the service so that whether a feature is within the budget can be verified before publishing. This app building platform is suitable for practically any kind of business, ranging from nonprofits to restaurants and bands or sports activities and real estate and also extends its coverage to religious organizations. The platform has been developed from the basics and upwards, keeping in mind the needs of the small businessman. Bizness Apps has a system for content management which is user friendly so that the user companies to build customized apps for the iPad, Android, iPhone, and for mobile Web applications. Even though individual apps can be created using customized design concepts, there is a wide range of designing templates which are customizable. There are features like push notifications, GPS tools, content sharing abilities, social media linkages, and shopping carts for mobile shopping activities, mobile booking and reservations and ordering of food the mobile. There is also custom built email forms for surveys and contact and mailing lists and more. A preview feature shows the features of the demo apps online or also these features can be viewed from mobile devices. Bizness Apps also has a diversity of handy in-app integrations with existing business apps. For instance, you contacts can be imported into an email marketing service module like MyEmma or MailChimp, and others. Bizness Apps are priced at $29 per month for mobile websites, or $59 per month for the native and the mobile applications.